So I was listening to one of my favourite podcasts Talk the Talk and they mentioned Google Ngram which searches an incredibly large selection of books and then graphs how many times they were used over time. Inevitably, given how many things are on my to-do list at the moment, I spent way too much time typing in random words from Harry Potter, Doctor Who, and other fandoms to see what came up. Muggle was used as early as the 1800s and TARDIS spiked in the 1820s. Naturally this piqued my interest and I had to test out some knitting words. Knitting and embroidery are significantly more widely used than crochet. Tunisian crochet and loom knitting turned up no results. Finger knitting started to turn up in 1960 and machine knitting started in 1880 with a huge spike in usage around 1940. Then I fell down the rabbit hole and started comparing needle types, sock construction, colour work, basically all the knitting specific words I could think of. At first glance it looks like toe up is more well used than cuff down. Then I dug a little deeper and looked at the books with references to Toe Up. I went through 3 pages and not one reference to knitting. I don’t think this graph will be able to settle the toe up vs cuff down debate! So again, nothing to do with knitting just pure coincidence. Maybe don’t talk about lending your DPNs to a scientist. They might just get very confused. Without DPN to skew the graph axis, it becomes clearer that circular needles entered the scene around 1860 and double pointed needles around 1940. I tried guessing what correlations there could be with words like circular knitting, knitting in the round, world war, and measles but none of them had a similar spike. I had a vague idea that I could just stumble on a spurious correlation but it wasn’t to be. Fair Isle has been around since the 1800s, but Intarsia appeared in 1850 and Entrelac slightly later in 1905. Or at least the word has been in usage since those times. And then just for fun I typed in three different spellings of polka-dots just to see which usage is most popular. Turns out polkadots it is. There you go! I still like polka-dots. 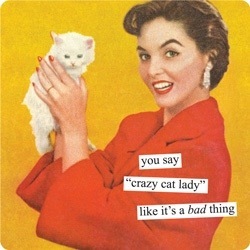 It appeals to me aesthetically. This popped up on my twitter timeline this morning, and I just had to share it. 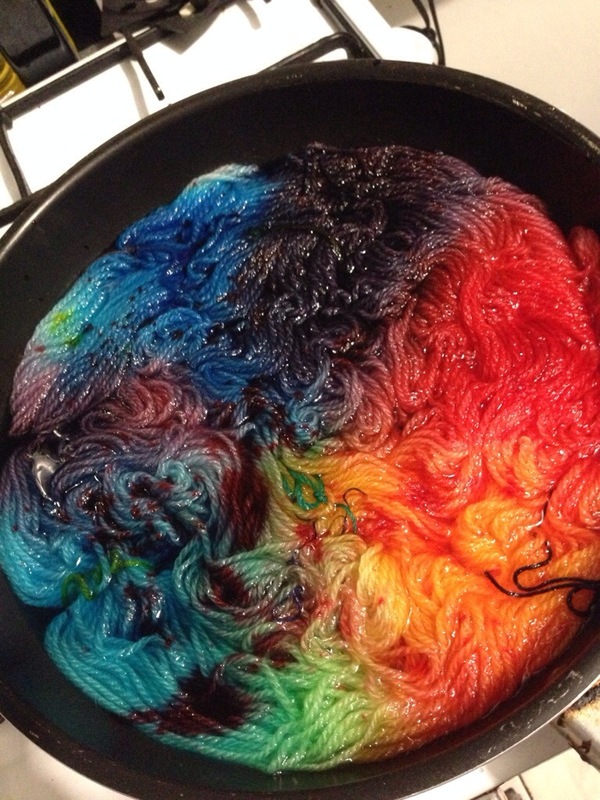 It doesn’t take long as a knitting blogger before you hear the name Elizabeth Zimmerman. But until this article I’d never been compelled to buy one of her books or seek out more information about her. Who else should I research? Who do you list as your knitting influences? 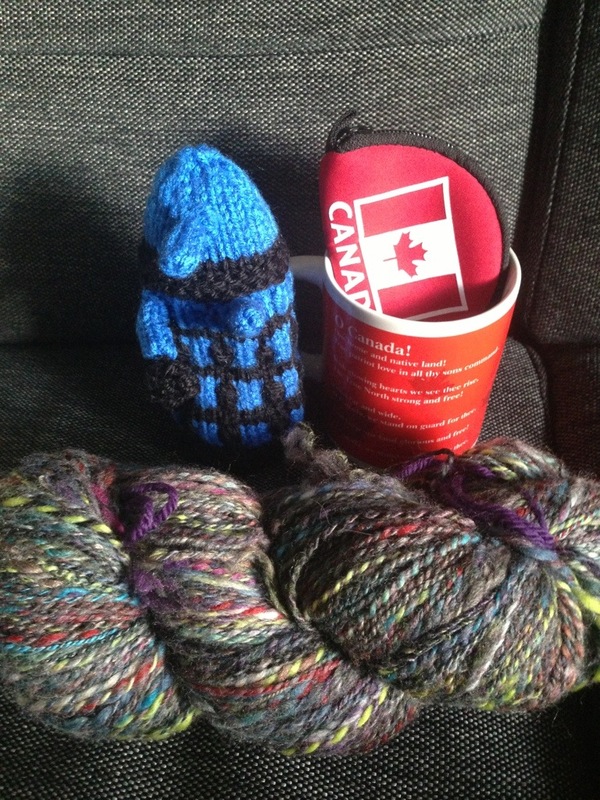 Who are your favourite knitters/designers/spinners/fibre artists? I am counting the weekends down to when we move, but I am not putting my life on hold. 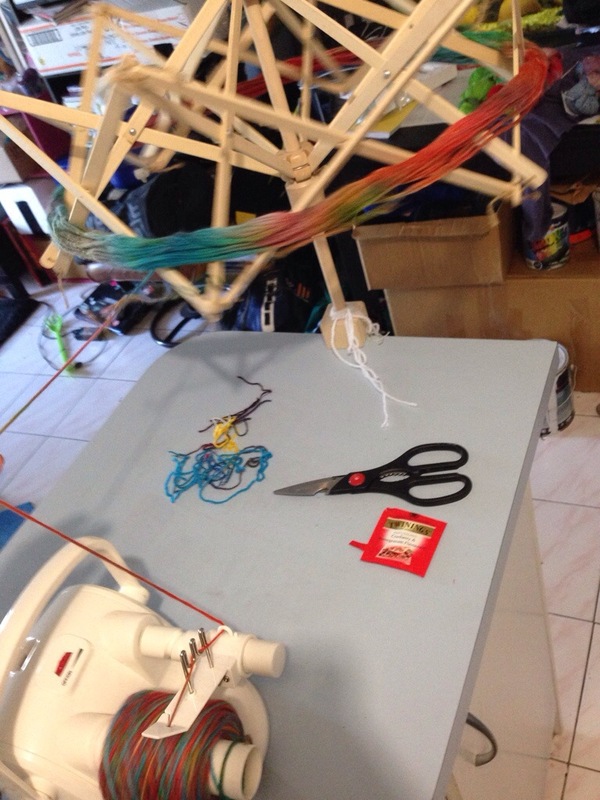 It is so frustrating to make things in a small space when you know there’s a craft room bigger than your lounge room just around the corner. But I can’t not make things. 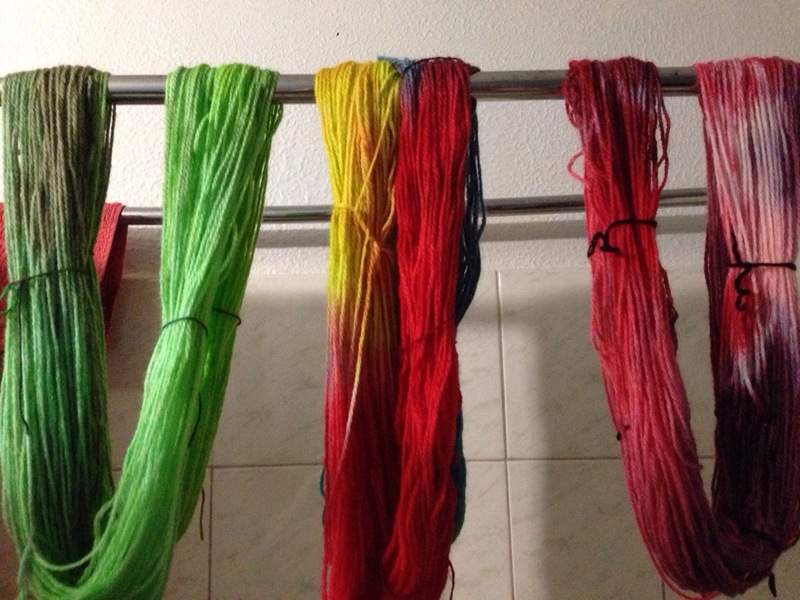 So, inspired by Jesse, (aka oocha and wee pleasures) I dyed some yarn. 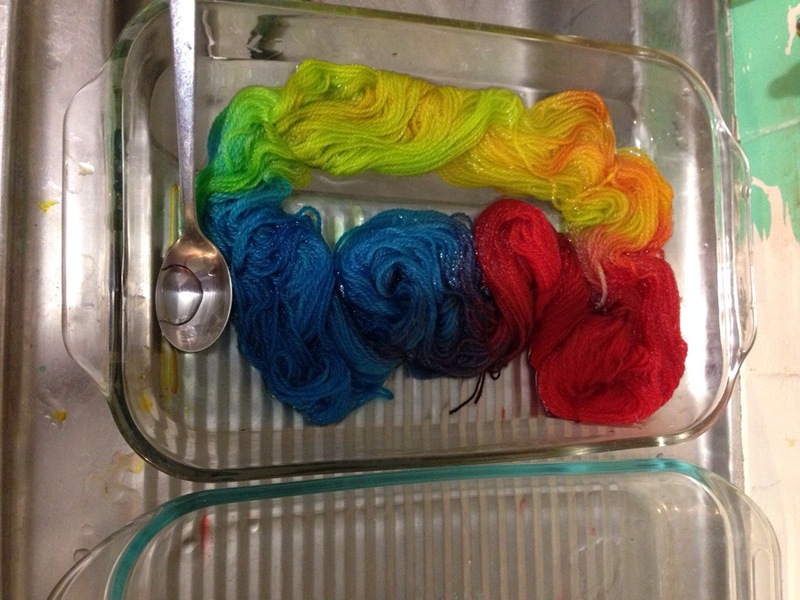 I have researched dyeing methods before and wrote it off as something to do once I had more space and equipment. But the chalk legs tutorial that Jesse pointed to is by far the easiest. As I had purchased some Moda Vera Pure Wool in anticipation of dyeing at some point I was able to do everything with materials I already had. I didn’t follow the instructions very well the first time, and added ALL THE COLOUR at once. 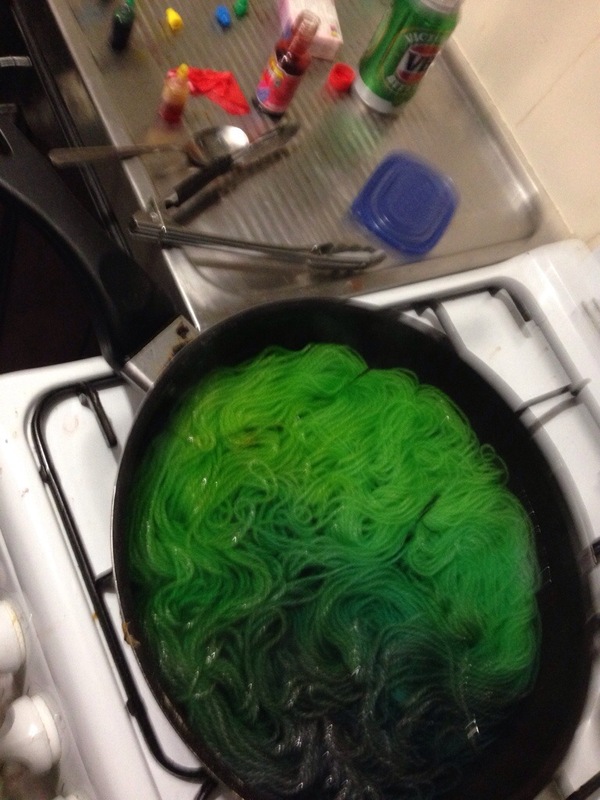 Which once I figured out my mistake I immediately took it out and then plunged the wool into cold water. And then I realised my second mistake, pure wool doesn’t appreciate sudden changes in temperature. Fortunately not too much damage was done. It felted slightly but it still ran through my ball winder ok.
It’s all really basic and really a lot of fun. And if the colours all look really hideous together please don’t tell me. They all look rather fetching to my slightly colour-blind eyes. 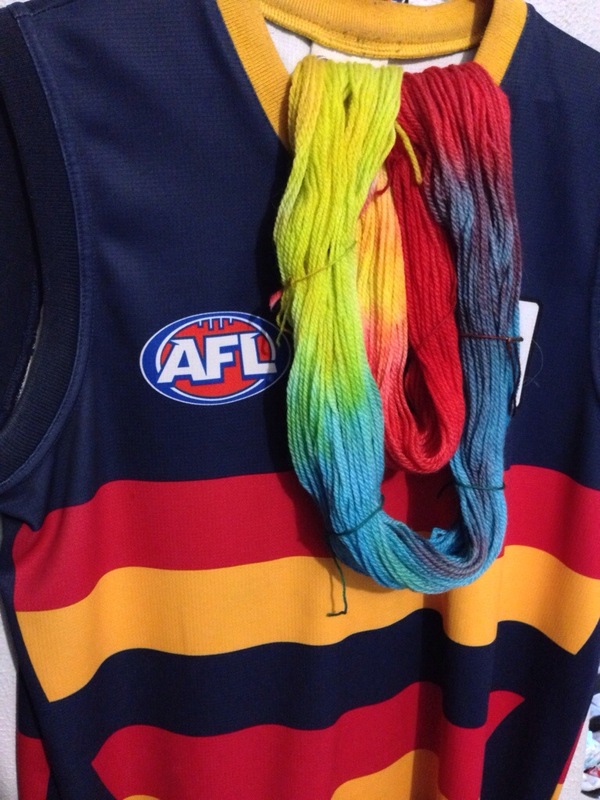 I did try to be inspired by something, but I don’t think food colouring dye charts are sophisticated enough to capture the Adelaide Crows complex palette. And of course once it was dry I had to wind it straight away and start using it. 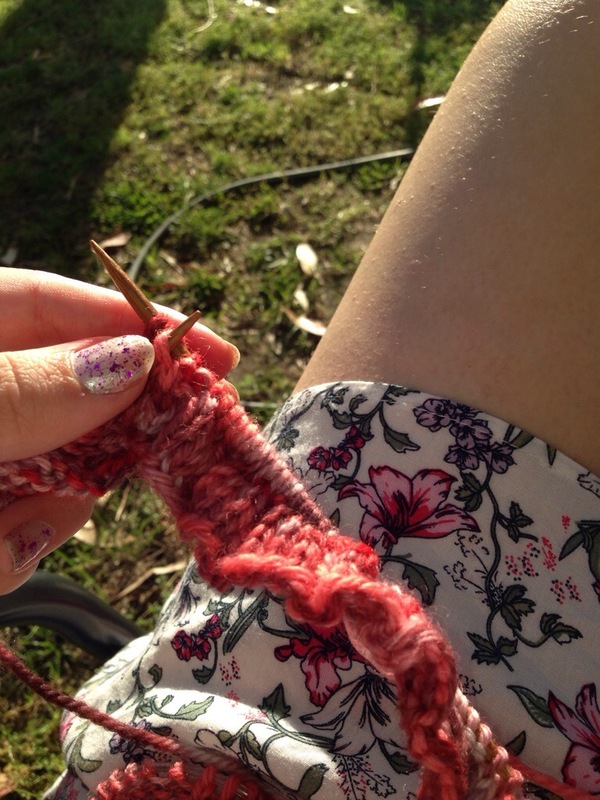 Even if I have a billion things still on my needles. And yes I’m totally counting this as a new craft! That takes the total for this year up to 4! The Elephant and his balloon. Oksoamy drew an awesome illustration for the children’s book that Manny and Bernard write one episode. This is the finished embroidery. As well as sending her something I was the third to comment on her post. 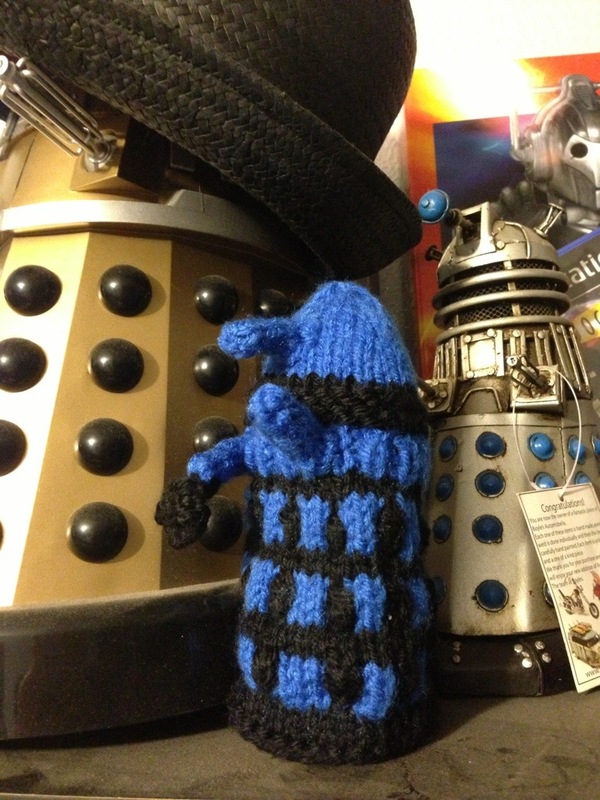 So I am now the proud owner of a knitted dalek, some Keri handspun!!! 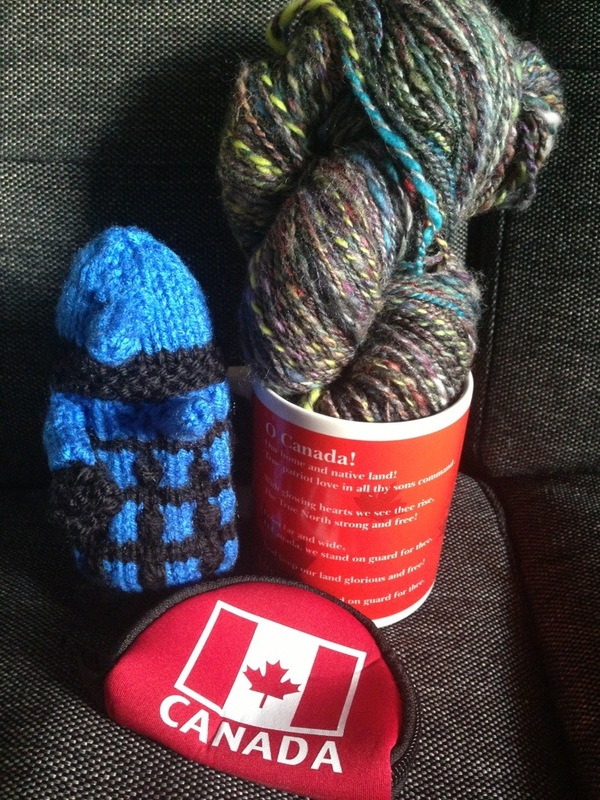 !, a Canada mug and Canada coin purse. 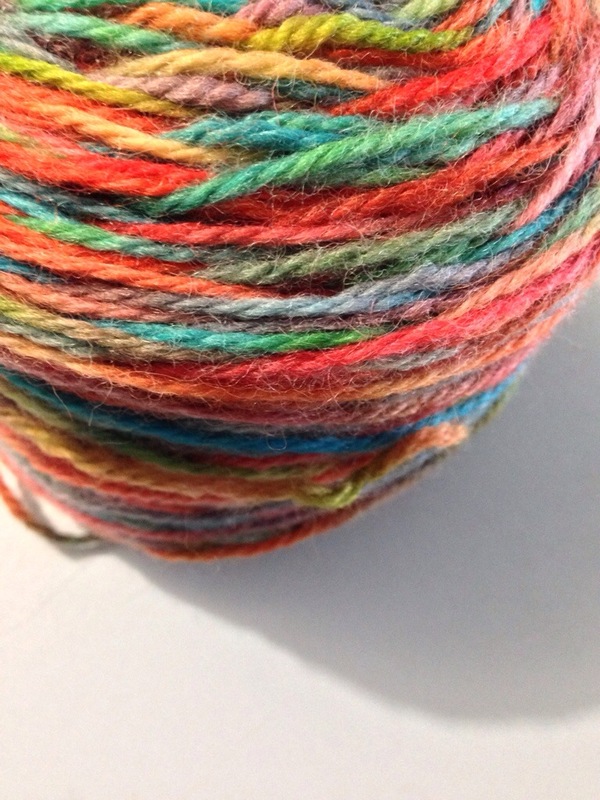 I have been dreaming about what to make from the handspun (which I confess I have fondled inappropriately). Or I could just leave it on display to be fondled and admired. Yup message received agonisingly loud and clear. I first started watching the 4th Doctor and Romana II. And then came the reboot and Eccleston and fantastic. And then David Tennant (swoon) and then tumblr and fangirling and squeeeee!!!! Considering I had never watched this until 2 years ago, I am completely hooked and could probably get more of the lyrics from Once More With Feeling correct if I was forced to sing for my supper. I will get messages from my brother at 2 am quoting black books. I have also spent a night, with my bestfriend on the recliner, me and my boyfriend on the couch and him getting black books quotes not just from the tv, but from both of us, with bonus cackling. I have a bracelet which says awesomesauce, so that probably qualifies Parks and Rec to be on this list. Both April & Andy, and Ben & Leslie tie for cutest couple on television. 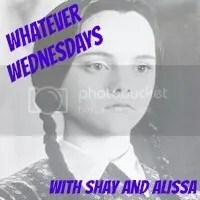 This was the first tv show that I ever fangirled over. Wet white shirt Colin Firth. Mum & I would stock pile the ironing to watch this together. Oddly enough Dad and my two brothers would find something else to do. And unfortunately this was the biggest gif of wet shirt darcy I could find. Firefly, Coupling, Downton Abbey, How I Met Your Mother (although just finish already! ), Fawlty Towers, Black Adder, Mad Men, 30 Rock…. and i’m going to stop now before I agonise over this post any more. Here have a video of the doctor who credits in the style of the Buffy credits.